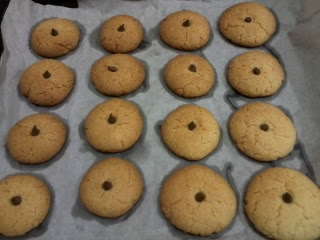 Attempted to bake butter cookies yesterday as I am already in Chinese New Year mood now. I tend to associate CNY with cookies. Moreover, I love butter cookies, especially store-bought Danish butter cookies, so I have decided to attempt to bake it yesterday. 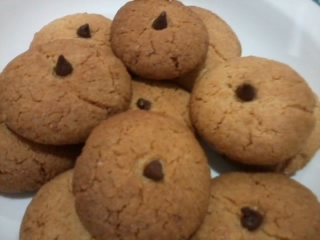 I baked the cookies after dinner yesterday. As usual, I reached home at about 6.40pm. Oh, before that, I had already called hubby to take out the butter to let it set at room temperature on the way back from work. When I reached home, hubby has cooked dinner and laid everything on the table. After dinner and doing the dishes, it was about 7pm (we are fast eaters). I then started preparing and mixing the ingredients, started baking at about 7.20pm, and by 7.50pm the cookies were ready and I could go to have my shower. Easy peasy as the recipe is only for 16 pieces of cookies. Here's my version for just two persons, yield about 16 pieces of cookies, depending on how you shape them. For me, I just rolled it into balls with my hands (as I don't possess any fancy cookie moulds or whatsoever cookie cutters) and gently pressed them to form a flat circle. I used: 1/4 bar good quality butter (SCX brand), 1 cup flour, 1/2 cup sugar, some vanilla essence, 1 egg yolk, 1 tbsp milk powder and chocolate chips (optional). I used my hand to mix everything in a bowl until it formed a clean, dry dough. 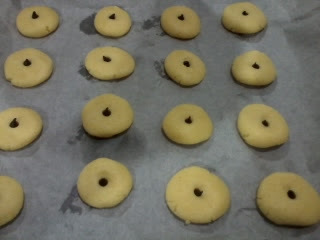 Pre-heat oven at 200 degrees for 15 minutes, then reduce temperature to 170 degrees before putting the cookies in. Bake for about 20 minutes until cookies turned slightly brown. Result? Hubby said it tasted better than any other commercial CNY cookies selling at the stores and commented I could consider baking my own cookies for the next upcoming CNY, haha. What a joke! The cost of baking my own cookies to distribute to friends and relatives would be more than then current DIY method which I am using for this upcoming CNY: Buy 2 or 3 kg worth of cookies from the sundry shop (only cost about RM30 or less), put it in cookie jars (recycled from last year), sealed nicely and ta-daaa, I don't have to buy any cookies to "bai nin" during CNY (yes, these cookies are just for "bai nin" and usually people will just chuck them aside and recycle the cookies when they go "bai nin" with somebody else later). Cookies are getting more costly each year, up to RM28 per jar, crazy !!! Last year, I was a fool to spend close to RM400++ on just cookies. And yes, just to distribute to friends and relatives during "bai nin" session and not for own consumption. Anyway, I don't have guests coming to my house for CNY (everything will be at my parents' or in-laws'), so I don't prepare any cookies at home. I only standby some boxed drinks or carbonated drinks, just in case, that's all.